In the past year, as the maternity cover for Communications Co-ordinator, I have grown to know ITC, have started to really familiarise and connect with our members, and enjoyed supporting their important work. Around the time of conference, I was thrilled to learn that I was able to continue my work with this company that is doing so much to support the performing arts, everything I am passionate about. I therefore approached our AGM and Conference day as a somewhat pivotal moment where I was truly able to connect with the sector. Here are a few of my reflections on the day. This incredibly important statement was made by new ITC Board Member Gavin Stride early on in the conference. Although social outrage and a rallying spirit unquestionably has its place as an important response to the current political and environmental uncertainties, being reminded to be excited about the possibility of change and remembering that there is space for curiosity about the unknown came as an energising breath of fresh air. Being towards the younger end of the spectrum in the theatre sector, with more years ahead of me to anticipate than past experiences to reflect upon, there have been times when the pressure to stall oncoming global destruction, or to respond to the increasing presence of the fascist politics has resulted in an overwhelming sensation of apathy and tiredness. It was wonderful to be told that the future isn’t going to be all bad, that the focus did not have to be constantly on turning negatives to positives, but that positives in their own right could come along! This was echoed by all of the panels’ inspiring speeches with a memorable statement on positivity by Shonagh Manson, ‘If things are uncertain it means that the door is open for different and new things to happen’. The brilliant ‘Managing Uncertainty’ panel struck the perfect balance of professional and personal reflections and helped create a an atmosphere where people were happy to share and really listen to each other. Kenneth Tharp, when discussing certainties and uncertainties in his life stated that 'I'm certain I have a lot to learn, I'm certain there has never been a greater need for empathy & understanding'. The day proved that if there is one thing that Independent Theatre has sorted, it’s empathy! The openness in the room after Stella Duffy’s vulnerable and courageous story, when people turned to their neighbour and shared their responses was palpable and spoke volumes about the warmth and generosity of the sector. This was a theme that progressed throughout the day, for example with the companies in the More than Surviving breakout groups generously sharing what they had learnt during difficult times. Peer learning is one of the great things that ITC facilitates amongst its members and I look forward to working with the team and Board over the next year to find many new ways to do this. At the More than Surviving Breakout – Jonathan Petherbridge drew a salient parallel between London Bubble, or indeed any company losing National Portfolio Funding and the idea of leaving one’s parents and home and learning to stand on one’s own two feet. Whilst there is no denying that the many similar stories of companies losing funding is disheartening, the focus and resourceful strategies of companies in the aftermath was an important lesson on the art of responsible, creative and ‘grown-up’ planning for the future. ITC’s anticipation of future post-Brexit uncertainties that the sector could be about to face in relation to employment rights, as well as their plans to work even more closely with unions over the next years was a welcome example of responsible planning! I came away feel hopeful about how much can be achieved when a company has a focused vision and the right partners. 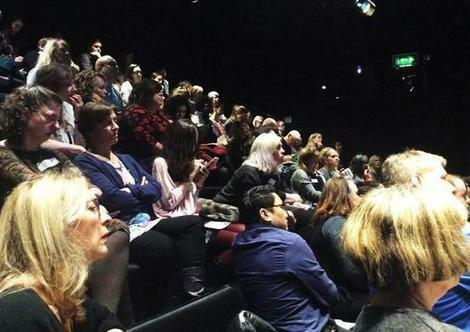 How artists and theatre companies should respond to global problems is a hard conversation to facilitate successfully, as it can seem so big and varied, but both the speakers and members contributed intelligent and generous ideas and provocations. Whilst combating the many issues in the world can feel like too big a task, the concrete advice on how companies can make a difference locally, starting with their communities gave many members something solid and practical to work from. Horse and Bamboo, on discussing the need to revaluate what is important, told of their decision to clear out part of their old props to make a space within their building for the public as that seemed a necessary thing to offer their local community. Whilst the impact of the changes that theatre companies can make, either through their artistic output or organizational decisions, remains unknown, the important message that came across loud and clear was 'I do know that if we don't do anything, nothing will happen.' perfectly articulated by Judith Knight of artsadmin. With so much emphasis on output, connecting outwards, and forward thinking it was good to occasionally stop, take stock and have some time for oneself. During the panel session amongst the infectious energy and positivity there was the quiet message, to be kind to oneself. ‘Don’t read too much news, don’t spend too much time on facebook, don’t watch 24hrs in A&E’ and ‘make time to do the activities you enjoy’ was the advice from Shonagh Manson, whilst Stella Duffy spoke of a time when with a seemingly insurmountable amount to do she came to a realisation, that all she had to do was ‘show up’, and that was good enough. Stopping, breathing, and taking a moment for self-compassion seem to be the first steps that we need to take if we want to look after other people as well! Everything about the day made me feel heartened to be part of such a hopeful, thoughtful and energetic sector. This sentiment was summed up perfectly by our CEO Charlotte Jones, during her presentation of our four year business plan. Thank you ITC members, board and staff for a brilliant year, here’s to many more! Wow what a great game as i am addicted in playing this and play whenever the time i get bloons btd5 play the game and full enjoy thanks for it. The Dubai considers as the gulp of major sky reapers. The world biggest shopping mall is mention by australian writings review situated in the Dubai. The hotels and the luxury are the sole investment returns for the people. Most of people visit Dubai for the investment purposes. I was telling people about the way that they are working on tree branch removal cost and this is how they learned new things. I think that it will be something new to try.